A fragrance that will entice your beloved, this concoction brims with soft and delicate floral notes while the composed with exotic woody notes of sandalwood and patchouli with a mellow touch of musk notes. The flacon is embellished with silver and blue beads lending to the majestic appeal of the fragrance. 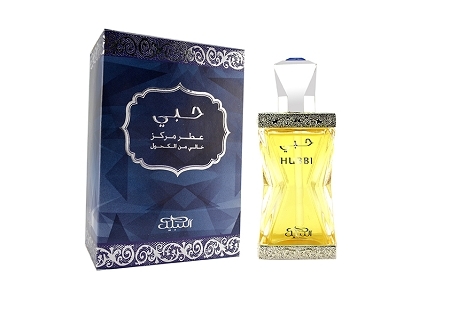 Top Notes: Rose, Ylang Ylang, Coriander Leaves, Bud Cloves. Middle Notes: Lily of Valley, Geranium, Cedarwood, Sandalwood, Patchouli. Base Notes: White Musk, Amber, Vetiver, Musk. ????? ????? ??? ???????? ??? ?? ???? ????? ????? ?? ??????? ????? ???? ??????? ??????? ??? ????? ??? ?????? ????????? ??????? ?? ???? ????? ?? ????? ?? ????? ?????? ?????? ????? ???????? ??? ??? ????? ???? ?????? ?????? ??????. ???????? ????? : ???? ???????? ????? ???????? ?????? ??????? ???? ????? : ???? ??????? ????????? ??? ????? ???? ??????? ????????? ????? ????? : ????? ??????? ??????? ???? ????? ????? ????????? ?????? : ??? ?- ?? ?